You've cleaned out that closet, or maybe your basement or attic. Perhaps you are moving, or maybe you just needed to make some room and simplify your life. Whatever the reason, you've done the hard part — donating your household items to Goodwill is easy. That's right, on the 15th of every month we celebrate YOU—our Club Goodwill REwards members! So shop Goodwill on April 15th and save more when you spend more! Spend $15, save 15%. Spend $20, save 20%. Spend $25 or more, save 25% on your total purchase! Are you looking for the perfect wedding gown at an amazing price? 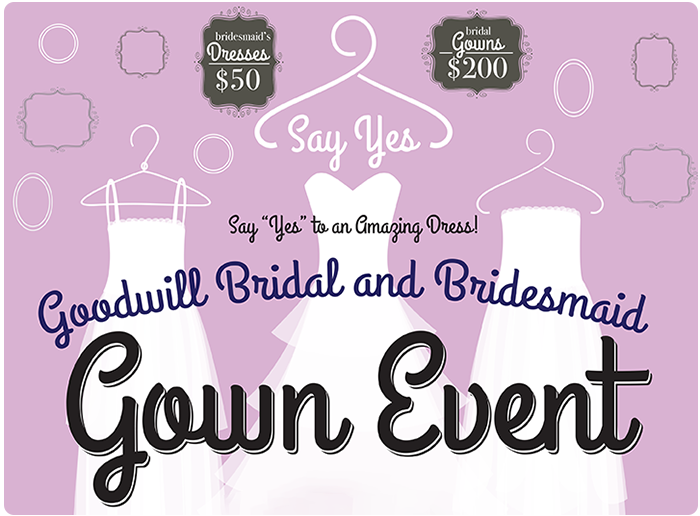 Then check out Goodwill's Bridal and Bridesmaid Gown Event on Saturday, April 7th from 9 a.m. until noon at our Goodwill Store & Donation Center in Wauwatosa! OVER 100 BRAND NEW, designer bridal gowns, as well as bridesmaid and prom dresses will be available to try on and purchase for a fraction of the original retail price (originally priced from $499-$1,500)! Plus we have an additional 100 donated gowns and dresses!